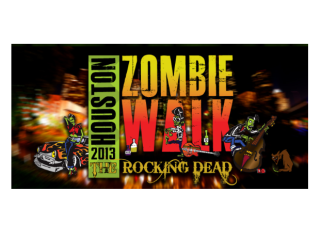 2013 Houston Zombie Walk: "The Rocking Dead"
Save the date and start getting your emergency supplies together. The Houston Zombie Walk is gathering its forces for an invasion unlike any seen before. Thousands will dress as zombies, superheroes, witches and countless other characters to walk through downtown Houston. The AGRO Sideshow will lead the horde through the parade route to Jones Plaza for a concert with the Dolly Rockers and the inimitable Reverend Horton Heat. This is a family friendly event created to raise funds for the Houston Children's Charity, the Houston Humane Society and the Dove Key Ranch Wildlife Center.